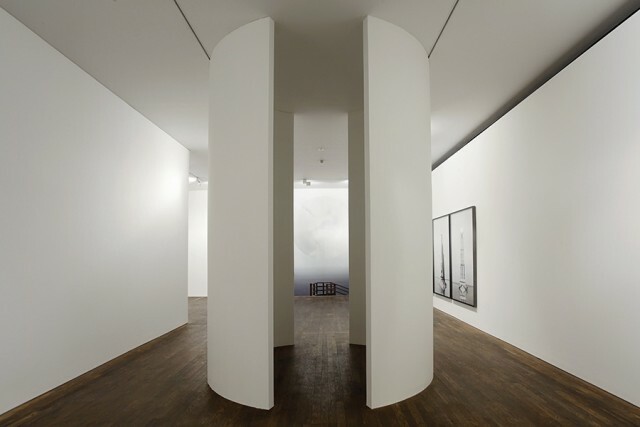 It seems no accident that visitors to 'Southern Light Stations', Noémie Goudal's first major solo show in London, have to climb all the way to the top floor of The Photographers' Gallery. Indeed it's fitting that Goudal's celestial themes should be presented as close to the heavens as possible. Upon reaching the fifth-floor gallery, viewers are confronted with images of enigmatic structures set within natural landscapes. These are displayed as a mix of photographic formats, from floor-to-ceiling wallpaper and large, framed works to tiny stereoscopic studies. This is all familiar territory for Goudal: if land, sea and sky are her work's recurring motifs, then 'Southern Light Stations' hones in on these previous ventures, most of all on the sky. The exhibition is organized such that the photographs fall neatly into three categories: 'Stations', 'Towers' and 'Cloud Plates'. The 'Stations' series (2015, numbered I-V) feature large, circular structures suspended above mountains or water or floating in space, while the equally ambiguous 'Towers' (2015, numbered I-III), sit on the horizon line between sea and sky, the structure's reflections the sole clue to the presence of water. Both 'Stations' and 'Towers' recall something familiar: weather balloons or perhaps even planets in the case of the former, and stone monuments or landmarks in the latter. However, as with all Goudal's structures, as soon as the seams and joins, ropes and guide wires are discovered, any notion of familiarity fades, and we are left with questions about the exact nature of these constructions and their function. Goudal makes no attempt to hide the evidence of fabrication in her structures, drawing attention to the artificial, man-made aspect of photography (lest anyone assume too much about its documentary nature). The sizes of the 'Stations' and 'Towers' prints have also been carefully considered. Given the gargantuan formats used in much recent art photography, these large-scale prints and wallpapers are not a particularly unusual sight. Yet the scale makes thematic sense in light of the monumentality of the objects depicted. On the other hand, a large format would not suit Goudal's third category of images, the 'Cloud Plates' (2015, numbered I-VI), which are presented as tiny stereoscopic sets (7 x 13 cm combined). The 'Cloud Plates' are exactly what you might imagine: some show blue skies, others orange, twilight or stormy grey ones, but all are scattered with clouds nonetheless. Unlike with 'Stations' and 'Towers', there is no ambiguity here, no obvious construction or fabrication within the images. They are, however, housed within a brightly lit circular chamber in the middle of the gallery. Inside the structure, each set of plates has been installed with its own stereoscopic viewer so that they can be seen in all their primitive 3D glory. The stereoscopic format (including its requisite viewing device) and the purpose-built chamber roughly mimic the experience of being in an observatory. It's a little gimmicky - the least constructed images in the exhibition require the most highly constructed viewing apparatus - but effective. Indeed, it seems to me that heavy-handedness as opposed to sleight of hand is central to 'Southern Light Stations' and to Goudal's broader oeuvre: we are supposed to notice the evidence of assemblage, construction and fabrication. It is easy to see these photographs as staging a contrast between nature and artifice; or to look at the clouds, celestial orbs and monumental obelisks and see our own relationship with the skies - which have helped us, since the beginning of time, to navigate paths both literal and figurative. What is perhaps most exciting about Goudal's work, however, is her ability to simultaneously employ and sidestep photography's clichés in order to create pieces that are objects as much as they are images. More than mirrors held up to our own world, or windows into other ones, Goudal's photographs, like so many elements within them, are a form of construction themselves.